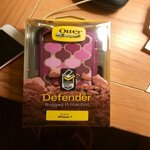 OTTERBOX CERTIFIED DROP+ PROTECTION Tested by us. Built for you. What do 24+ tests and 238+ hours of testing mean to you? They mean your OtterBox case is ready to dive into your day without a second thought — just like you are. OtterBox Certified Drop+ Protection means drops, bumps and fumbles are just the beginning. It means your device is protected from the barrage of wear & tear you subject it to everyday. So go ahead — do what you do and leave the protection to us. I just want to protect my investment so I have always purchased an otter box. By far the best cases I have ever had. They typically last me about a year before I purchase another one. Sometimes I can use them longer depending on the wear and tear of the case. I can drop my phone and nothing happens to it. Overall, I love them. This case is bulky for an individual, and the screen protector is very oily on the inside, no idea about that one. I've had it for a couple weeks and it's been pretty strong. Turning silent on and off and going to plug in your charger or something is difficult because there's a super tight flap to block you. Over all, I like it and it is.... ok.... to put in and take out of pants.